Cancer care plans are roadmaps that make sure you and your patients know where they are going and how to get there. This roadmap should be discussed with other members of the patients’ health care team and can be shared with other health professionals involved in their care, such as primary care doctors, radiologists and surgeons. Cancer care plans are useful whether someone is newly diagnosed, making the transition from active treatment, or changing the course of treatment. This plan should be discussed before beginning treatment and can help guide patients as they talk with doctors and other members of the health care team about what is important to them and any concerns they may have. It will help when talking about treatment options and possible side effects. The treatment plan can be shared with other doctors patients might see for cancer treatment or for any other health care needs. 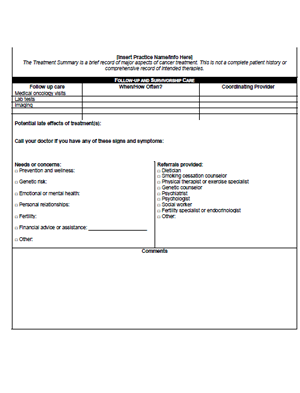 The treatment summary should be provided once your patient transitions from active treatment and can be shared with other doctors and health care providers. It provides a list of medicines the patient is taking, describes any ongoing issues that need to be addressed, and describes the cancer care he or she has received. This plan will help map out your patients follow-up care upon the completion of treatment. Cancer survivors need to be monitored for the rest of their lives and have different health care needs than before they were diagnosed. The Follow-Up Survivorship Care Plan helps to ensure that everyone involved in the patient’s care knows what follow-up is needed, when it is needed, and who he or she should see for that care. During your patients’ cancer treatment, you’re their lifeline. For them, it is a time with many questions. Your care gives your patients the hope and opportunity to live beyond cancer. Unfortunately, many of these patients feel that once active care is complete, they are on their own. During treatment, they were surrounded by constant care from you and your team, but now they are alone with questions about what’s next. That’s why Journey Forward was created. It addresses the need for better post-treatment coordination and communication between cancer survivors and their health care team. A recent study conducted by the Journey Forward team shows that the majority of primary care physicians and virtually all cancer survivors want a survivorship care plan to improve their care. Survivors need to be assured the quality care they received during active treatment will continue. Journey Forward can help survivors know what’s next and what to expect. Journey Forward can help you bridge your excellent care for patients as they begin to reconstruct their lives and move forward. 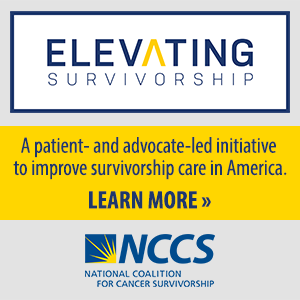 A Survivorship Care Plan is a coordinated post-treatment plan between the Survivor’s oncology team, a primary care physician and other health care professionals. 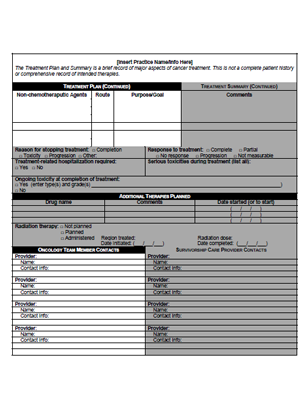 The oncologist creates a summary of the Survivor’s treatment and includes direction for future care. 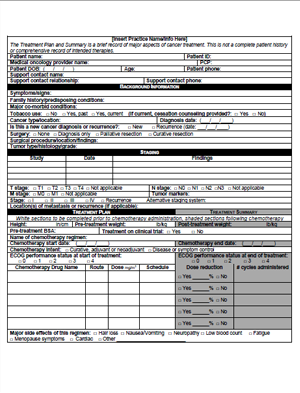 This comprehensive medical summary, given to the Survivor and their primary care physician, helps support better survivorship care. The plan includes important information for monitoring possible secondary cancers and any late- or long-term effects of the Survivor’s cancer treatment. A Survivorship Care Plan also relieves a Survivor from having to recall all the details of treatment and ensures all future health care providers are working as a team for the Survivor’s care. Support for breast cancer, colon cancer, lymphoma, and other types of cancer. Ability to expand Care Plans with information on symptoms to watch for, effects of treatment, support resources, and more.